960 Gade Road- UpperAvailable March 15th, 2019$2800 Includes UtilitiesNS/ Pets Case by Case The main- top floor offers a spacious kitchen and dinning room with hard wood floors and carpet in the bedrooms. A full garage and master bathroom with extraordinary finishing in the heart of Bear Mountain. 7-922 Arm Street Available May 1st, 2019 $2600 + Utilities NS/No Pets Newly renovated charming 3 bedroom, 2 bath home townhouse one block from Gorge Waterway. 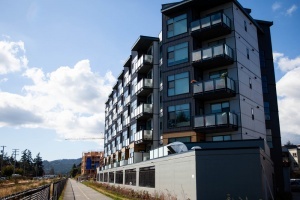 Located minutes from Downtown Victoria, the Galloping Goose and Selkirk Waterway. 954 Summerstone Rd. 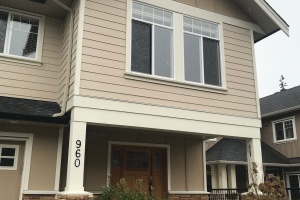 $2400 per month plus utilities 1 year leaseAvailable April 15, 2019NO PETS , NO SMOKING Great Langford neighborhood Bright and like new 3 bedroom, 3 bath home. Great 3 level open floor plan.. Designer kitchen, stainless steel appliances, with balcony off kitchen. Gas fireplace in living room and large windows throughout to bring in loads of natural light. 2939 Burlington Cres Available March 01, 2019$2300+ UtilitiesNS/ Pets Considered Wonderful home centrally located due to the extension of the Westshore Parkway, showcases three-bedrooms, three bathrooms located close to shopping centres, parks, the YMCA and Elementary and Middle School locations. 403-1536 Hillside AveAvailable May 01, 2019$2300 + UtilitiesNo Smoking2 Bedrooms + Den, 2 full bath, Top and Corner Suite with In-suite Laundry and 1 parking – furnished condo, built in 1992 and well maintained.The Den is very big.Please read Bylaws about pets.Steps away from #4 Bus stop and convenient to all the amenities.Available May 1, 2018. 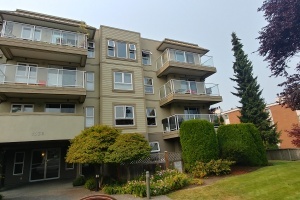 107-3900 Shelbourne StreetAvailable May 1, 2019 $1,900 per monthNS/NP Spacious corner suite in Caywood Court, located in the Gordon Head area, just off Shelbourne. This is a lovely two bedroom two bath corner unit garden level suite close to shopping, transit and amenities. Featuring a large living area, a bright kitchen and its own, enclosed greenhouse garden off the kitchen. 304-1145 Sikorsky RoadAvailable: Now $1895 + UtilitiesGeo-thermal radiant heat and hot water included. NS/NPLovely views of the Olympic mountains from this 3rd floor 2 bedroom, 2 bath condo. Fantastic open floor plan, with granite countertops in kitchen/eat up bar, and stainless steel appliances. Living room has electric fireplace, laminate floors, and access to your own balcony. 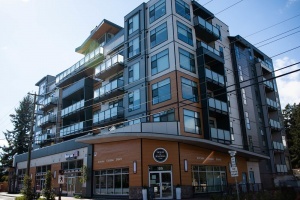 2580 Fifth Street- Upper Available March 15th, 2019$1795 + $200 Flat Rate UtilitiesNS/NPBright 2 bed 1 bath upper suite located in Quadra village central to grocery stores and coffee shops. The unit has hardwood floors, Kitchen comes with a dishwasher but no microwave. Shared laundry and yard, no pets. 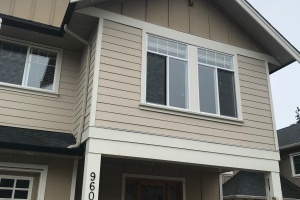 108-3319B Painter road $1725 + utilitiesAvailable May 3rd, 2019NS/NP Brand new two bed and one bath apartment off Metchosin road. This unit features spacious a brand new spacious kitchen, a small balcony off the living area, large windows allowing ample light into the unit. 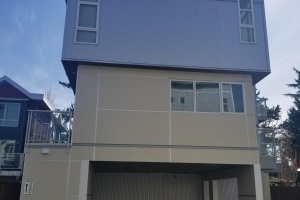 One parking stall is included in the rent,. 311-2854 Peatt RoadAvailable June 01 2019$1695 + UtilitiesNo Smoking/ One Small Dog or Cat Considered Two bedroom, two bathroom apartment in Peatt Commons 1. Close to all amenities- shopping, transit and many new restaurants. Features include nine-foot ceilings, open living area, in-suite laundry and plenty of storage space. Kitchen includes a dishwasher and in suite laundry. 212-2854 Peatt RoadAvailable June 01 2019$1675 + UtilitiesNo Smoking/ One Small Dog or Cat Considered Two bedroom, Two bathroom apartment in Peatt Commons 1. Close to all amenities- shopping, transit and many new restaurants. Features include nine-foot ceilings, open living area, in-suite laundry and plenty of storage space. Kitchen includes a dishwasher and in suite laundry. 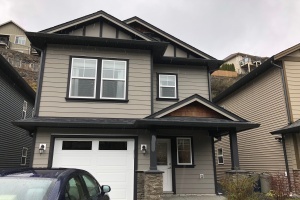 2580 Fifth Street- Lower Available March 15th, 2019$1595 + $200 Flat Rate Utilities NS/NPBright 2 bed 1 bath lower suite located in Quadra Village close to grocery stores and coffee shops. This unit offers a full bath and kitchen with a dishwasher, there is shared laundry on site as well as a shared back yard with bike storage. Rent per month is $1595 + $200 for utilities. 301- 784 Hockley Avenue Available May 15th, 2019 $1595 Includes HW on demand/Parking/Locker NS/Pet Considered Two bedroom two bath corner apartment ( 780 sq.ft.) in Village Walk West Phase 2 in Langford- Walk to all the amenities the heart of Langford has to offer -- restaurants, yoga, library and main transit to town. 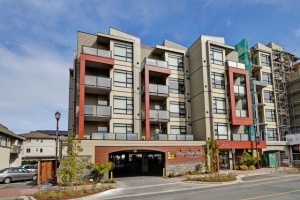 612-733 Goldstream AvenueAvailable June 1st, 2019$1540 + UtilitiesNS/Cat/Dog under 30 lbs Beautiful and modern one bedroom plus den and one bath apartment in the Railside House in the heart of Goldstream near buses, grocery store, shops and restaurants with parking. 424-2745 Veterans Memorial $1500 per month plus utilities Available April 15, 2019NO PETS/NO SMOKINGReflections Building in LangfordLocated on the 4th floor, steel and concrete building. 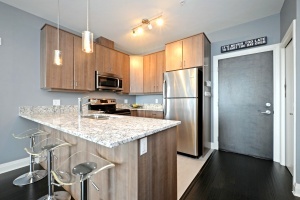 Bright 1 bedroom, plus Den, 1 bath condo, open kitchen/living room with balcony off living room. 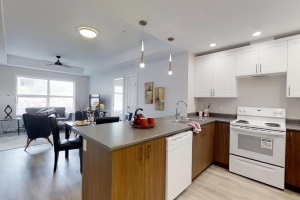 605 - 777 Hockley Avenue $1495 includes parking stall Available June 1st, 2019 NS/Small Dog or A Cat Considered 1 Bedroom plus den 1 Bath apartment (668 sq.ft ) features 9’ ceilings, vinyl plank flooring, hot water on demand, heat pump/ air conditioning, in suite storage and one off street parking stall. 5 appliances include a dishwasher and in suite stacking washer/dryer. 606-2854 Peatt RoadAvailable June 01 2019$1450 + UtilitiesNo Smoking/ One Small Dog or Cat Considered One bedroom, one bathroom apartment in Peatt Commons 1. Close to all amenities- shopping, transit and many new restaurants. Features include nine-foot ceilings, open living area, in-suite laundry and plenty of storage space. Kitchen includes a dishwasher and in suite laundry. 110-2854 Peatt RoadAvailable June 01 2019$1425 + UtilitiesNo Smoking/ One Small Dog or Cat ConsideredOne bedroom, one bathroom apartment in Peatt Commons 1. Close to all amenities- shopping, transit and many new restaurants. Features include nine-foot ceilings, open living area, in-suite laundry and plenty of storage space. Kitchen includes a dishwasher and in suite laundry. 203-784 Hockley Avenue Available May 1st, 2019$1450 Includes Parking/Storage NS/Pet Considered One bedroom one bath apartment ( 558 sq.ft.) in Village Walk West Phase 2 in Langford- Walk to all the amenities the heart of Langford has to offer -- restaurants, yoga, library and main transit . 310-2854 Peatt RoadAvailable June 01 2019$1395 + UtilitiesNo Smoking/ One Small Dog or Cat Considered One bedroom, one bathroom apartment in Peatt Commons 1. Close to all amenities- shopping, transit and many new restaurants. Features include nine-foot ceilings, open living area, in-suite laundry and plenty of storage space. Kitchen includes a dishwasher and in suite laundry. 503-784 Hockley Avenue Available June 1st, 2019$1395 + Utilities NS/Pet Considered One bedroom one bath apartment (558 sq.ft.) in Village Walk West Phase 2 in Langford- Walk to all the amenities the heart of Langford has to offer -- restaurants, yoga, library and main transit . 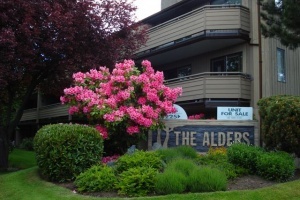 203-733 Goldstream AvenueAvailable May 1st, 2019$1375 + UtilitiesNS/Cat/Dog under 30 lbs Beautiful and modern one bedroom, one bath apartment in the Railside House in the heart of Goldstream near buses, grocery store, shops and restaurants with parking. 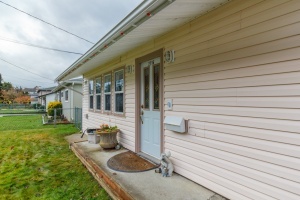 887 Wild Ridge WayAvailable May 01, 2019$1350 + $60 Flat Rate Utilities NS/ Pets Considered Wonderful two bedroom suite available in Happy Valley near the end of a quiet cul-de-sac. This suite features a private entry with patio, open concept kitchen and living area with a lovely hardwood laminate flooring, and shared laundry onsite. Close to schools and an easy commute into Victoria. Live in Langford's first concrete tower.Just steps away from all Langford has to offer.Available Move In March 4th, 2019Units starting at $1310Pet FriendlyConcrete Construction100% Smoke Free6 Appliance PackageIn-suite LaundryQuartz CountertopsUnderground ParkingKey less Entryhttp://www.danbrookone.comTo arrange a viewing, please call or text 250-213-9398 or email: rentals@thepropertymanagers. 3384 Merlin Road May 01, 2019$1250 + Utilities NS/ Pets OK Large 1 bed carriage house suite Get out of the basement. This large, bright and clean 1 bed suite is situated above a free standing garage, so you aren’t sharing any walls. Open concept with your own meter and your own laundry. This is about as good as it gets in a 1 bed suite. Pet friendly too. 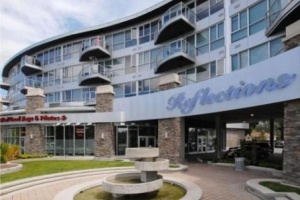 106-1150 Rockland Ave$1195 includes heat and hot water ( Parking available for $50 monthly)Available May 1st 2019No Pets/No smokingSpacious 1 bedroom unit in Rockland, a close walk from downtown Victoria! Open concept living area with lots of natural light. Rent includes heat/hot water and a storage locker. There is coin-operated laundry on-site. 307-540 Pandora Avenue Available May 01, 2019$1375 Includes Bike Storage No Smoking/No Pets Allowed Want to live downtown with Chinatown and the waterfront at your doorstep? This bachelor unit (415 sq.ft.) at Fan Tan Alley features contemporary finishings, white appliances: fridge, stove, built in microwave & quiet closing cabinet. Kitchen with white appliances. 103-1760 Fort Street Available May 01, 2019 $1150 Includes Heat & Hot Water NS/NP This one bedroom second floor suite in a smaller apartment building near Fort & Richmond has it all. 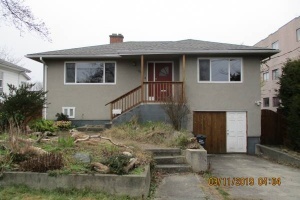 Close to bus routes to downtown, U-Vic & Camosun. Rent includes heat, hot/cold water and a storage locker. Parking $25, if available. 3-931 Mcclure Street$700 All InclusiveAvailable May 01, 2019NS/NP Cozy room for rent, bright, small kitchenette shared bathroom. $700 all included. Available May 01, 2019 no smoking no pets. To arrange a viewing, please call or text 250-213-9398 or email: rentals@thepropertymanagers.ca. For all other listings, visit www.thepropertymanagers.ca for all our listings. 3307 Myles Mansell Road- Lower bachelor suite Available June 1st, 2019$650/monthly + $100/monthly for water + garbage + hydroNo smoking/No pets Modern 300 sq.ft. 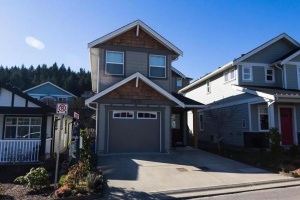 bachelor suite in a house, with separate entrance located off Happy Valley Road in Langford. Features fridge +stove, one large closet plus in-suite washer/dryer. Five minutes from Westshore Town Centre.